1. What is the Radius of Hollow (RoH)? 2. How do I know which Radius of Hollow (RoH) is best suited for me? 3. How often should I be sharpening my skates? behind will result in rust buildup. 4. I’m getting a poor finish on the blade. What should I do? Check the condition of your diamond tip! It should not be rounded, but have a sharp point. Be sure to turn the tip with each dress to get a different facet of the diamond dressing the wheel. Make sure there is no play in the dresser arm or slides. Check the spring loaded end of the dresser arm for play. The finish of your dress relates directly to the finish on the blade! 5. Should I mount the skate heel-to-toe, or toe-to-heel when sharpening? Though it isn't bad form to choose one way or the other, Blademaster always recommends that you sharpen from heel-to-toe. This is to stay consistent with contouring operations, which must be mounted heel-to-toe with the operator sharpening right to left to move with the wheel. 6. Why should skates be contoured? 7. What is the Radius of Contour (RoC)? The Radius of Contour (RoC) describes the lengthwise curvature of the skate blade. It is sometimes referred to as the 'profile' or 'rocker' on the blade. Skates commonly have a single radius of contour (eg. 9 foot, 11 foot), but Blademaster contouring systems can optimize performance by applying multiple radii or more complex shapes to your skates, therefore giving you improved speed and agility. 8. What does Pitch mean? What does Lie mean? directly on the high point of the contour; balanced between falling forward or backward. 9. How often should my skates be contoured? Because contouring shapes your blades, it is important to have your skates contoured to your preference upon purchasing them. For maintenance purposes, you should consider re-contouring them once or twice a year as it acts as a blank canvas for a suitable lie and radius on your blade. Should you damage your blades you should also consider re-contouring them. 10. What grinding wheel do you recommend? Many factors affect the performance of a grinding wheel and the resulting finish achieved on the bottom of the blade. These include the type of abrasive, bond material, grit size, balance, and ultimately personal preference, depending upon how aggressive the operator is in the sharpening process. Cost is also a consideration. However, our most popular wheel is the 8MXRUBY. 11. Is cross grinding necessary in the sharpening process? Yes. 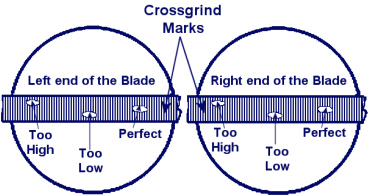 Though it may not be required with every skate prior to sharpening, the purpose of cross grinding is to remove the old edge, which may have become dull and damaged, and to establish a grind pattern. Cross grinding acts as a blank canvas for a suitable lie and radius on your blade (similar to the contouring process). 12. How can I tell if my holder is centered and properly aligned with the finishing wheel height? If your skate holder is already centered, your witness marks should be directly located in the center of your blade. 13. My witness marks aren’t centered. How do I adjust my holder so I can center my skate holder? (a) If your skate holder has cam handles: If your witness marks are not centered, you’re going to want to adjust the cam handle on the end of the blade that isn’t centered – either adjust them up or down depending on where your witness mark is currently located on your blade.  If the blade is too high, then you would be adjusting your cams down.  If the blade is too low, then you would be adjusting your cams up. Once you have adjusted your cam, create two new witness marks on each end of your blade. Continue to make these adjustments until your witness marks on both ends are centered on your blade. Once centered, you’re going to make one swift and complete pass (maintaining even pressure)across the wheel. If your blade is straight, you will see the hollow grind centered all along the entire length of your blade. If you have achieved this, you are ready to sharpen your skates.  If the witness mark is too high on one side, lower that side by turning the knob on at that side of the blade clockwise.  If the witness mark is too low on one side, raise that side by turning the knob on that sideof the blade counter-clockwise.  If the entire blade is too high, lower by turning the rear knob counter-clockwise.  If the entire blade is too low, raise by turning the rear knob clockwise. Note – Our High Performance family of holders (i.e. SH6000, SH7000, SH8000 etc.) are designed to work with our BR100 & BR1000 skate gages. Two clicks of the detent knobs are relative to one graduation line shown on the gage. 14. We recently purchased a BHC2005 height comparator gage, but I can’t find the center line of the grinding wheel. Be sure to calibrate your gage to the correct specs! Start by dressing your wheel to 3/8”. When you have done this, you’re to clean your table top of all debris. Once completed, you’re to set the height comparator gage in front of the finishing head and slowly move it so that the two bearings are cradling both sides of the wheel. Now lock the magnet in place. Once locked into place loosen the bezel clamp and begin turning the face of the bezel until you have reached the zero (0) indicator. Retighten the bezel clamp. Now that the gage is calibrated, you need to adjust your skate holder. Lock the gage to the table top where it is clear of everything. With your skate in its holder, you’re to touch the heel of your blade to the gage’s bearings. Adjust the holder until your bezel reads zero (0). Do the same of the toe of your skate. Once both sides of your skate reads zero (0), your skate holder has been centered and you are ready to sharpen. 15. I have sharpened my skate but I am not achieving square edges.  Is your blade straight? If your blade is bent, you will not have square edges after sharpening.  Have you properly centered your holder? Refer to the above tips on how to center your skate holder.  Could I have over-tightened my clamp? If you over-tighten your bronze clamp assembly you will warp your skate blade.  Have I properly removed all burrs from my blade after sharpening? These little fibers of steel can be a contributing factor to uneven edges. If you have checked the above and are still experiencing issues, you can contact our Customer Service department at toll-free 1-888-648-7776. 16. I’m seeing a lot of chatter on my blade. What am I doing wrong?  Are you maintaining consistent cutting pressure on the holder when sharpening? Individuals new to sharpening often let up on the cutting pressure once their blade meets the wheel. You must try to maintain cutting consistency while sharpening.  Are you using a finishing compound on your last pass? We recommend using our Gusto Glide (TSM4030) on your last pass as it should remove any remaining cross grind marks or chatter marks so long as you are maintaining consistent cutting pressure on your last pass.  Have you recently changed your finishing wheel? Be sure that you have properly tightened the grinding wheel nut. There shouldn’t be any play with the wheel when it has been swapped out.  Check the condition of your diamond tip! It should not be rounded, but have a sharp point. Be sure to turn the tip with each dress to get a different facet of the diamond dressing. Make sure there is no play in the dresser arm or slides. Check the spring loaded end of the dresser arm for play. The finish of your dress relates directly to the finish on the blade! If you have checked the above and are still experiencing chatter marks, we recommend contacting your local area representative for further assistance. 17. How do I know what compound to use for my last pass? It is all a matter of preference. Veteran skate sharpeners prefer our Gusto Glide (TSM4030) as it is a synthetic compound that provides you with a mirror finish without running the risk of over-polishing and gumming up your finishing wheel. 18. When should we change our filter? The majority of our stand-alone models will feature our filter status indicator light that will be lit when the filter requires maintenance. With this in mind, it is important to habitually clean your filter to ensure proper airflow. It is good form to clean your dust tray; depending on the volume of skates you are sharpening, you may want to consider cleaning it daily or weekly. We recommend that you tap out your filter to rid it of excess debris. Be careful not to wet the filter as it is coated with a flame retardant that is soluble. When you have noticed that cleaning the filter is no longer helping and the exhaust has diminished in suction, it is time to change your filter. 19. How do I know when it is time to change my skate pad? Skate pads will discolor and they will thin out in the center of your holder. Be careful not to scratch your tabletop due to grit buildup on your skate pads. 20. How do I remove my skate pad? The skate pads are designed to peel off for quick replacement. Should you see any remnants of adhesive, please feel free to use a cleaner to remove any excess adhesive prior to the installation of the new pad. 21. What is the difference between your TSM687 and TSM688? The TSM687 is an economical diamond dresser that features a 1/15 carat diamond and is an ideal dresser for low volume sharpening. Our TSM688 is a 1/7 carat diamond dresser that is designed with high volume sharpening in mind. Both dressers feature a diamond tip that is precisely centered in the quill to ensure that an accurate RoH is imparted to the grinding wheel. 22. How frequently should I be changing the diamond in my quill? This all depends on how frequently you find yourself sharpening and redressing your finishing wheel. The average diamond allows you to dress 1-2 grinding wheel(s) depending on how often you are redressing your wheel. Be sure to always rotate your diamond quill to ensure even wear on your diamond; it should never be rounded as your diamond should always come to a point. Doing this rotation extends the life of your diamond. 23. I’ve noticed that you carry a variety of grinding wheels. Does it matter what diamond I use in relation to the wheel of my choosing? use alongside this wheel due to its unit of weight. Our high performance wheels (i.e. 8VBP, 8GC, 8AS etc.) are also designed with form dressing in mind.